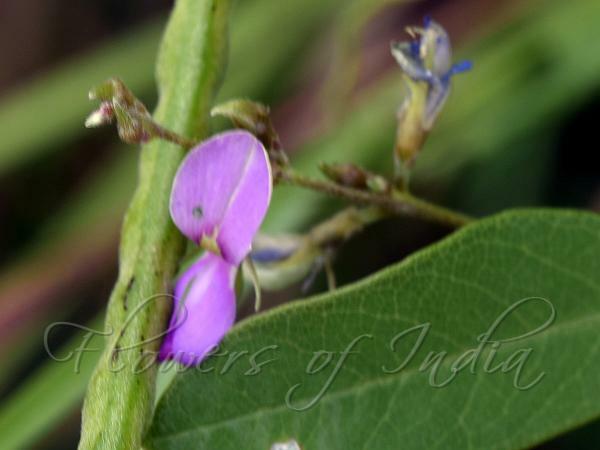 Slender Flowered Milkpea is a climbing or trailing herb, with stems velvet-hairy. Leaves are 3-foliate; leaflets broad-ovate to circular or linear to narrow-elliptic, 1-7 cm long, 0.3-2 cm wide, tip blunt to pointed, finely mucronate or notched, upper surface hairless, lower surface velvet-hairy; leaf-stalk 1-4 cm long. Flowers are borne in 1-12 flowered racemes, carried on flower-cluster-stalk mostly 1-4 cm long. Calyx is 3-6 mm long. 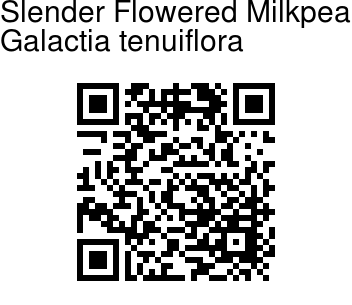 Flowers are 8-9 mm long; standard mauve to pink, sometimes with whitish eye, drying yellow; keel usually white to pink. Pods are linear, 1.5-4 cm long, velvet-hairy; seeds 2-3.5 mm long, brown to blackish. Slender Flowered Milkpea is found in Africa, Nepal, India, Ceylon, east to China, Malaysia, Australia, at altitudes of 1000-1100 m.